Singer-songwriter Woody Guthrie emerged from the dust bowl of Oklahoma and the Great Depression in the mid-20th Century, with lyrics that embraced his views on ecology, poverty, and unionization in the USA., paired with melody reflecting the many genres of American folk music. The American folk-music revival began during the 1940s and peaked in popularity in the mid-1960s. Its roots went earlier, and performers like Josh White, Burl Ives, Woody Guthrie, Lead Belly, Big Bill Broonzy, Richard Dyer-Bennet, Oscar Brand, Jean Ritchie, John Jacob Niles, Susan Reed, Paul Robeson and Cisco Houston had enjoyed a limited general popularity in the 1930s and 1940s. The revival brought forward styles of American folk music that had, in earlier times, contributed to the development of country and western, jazz, and rock and roll music. 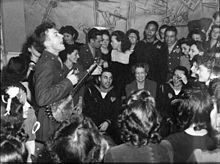 Pete Seeger entertaining Eleanor Roosevelt, honored guest at a racially integrated Valentine's Day party marking the opening a Canteen of the United Federal Labor, CIO, in then-segregated Washington, D.C. Photographed by Joseph Horne for the Office of War Information, 1944. The folk revival in New York City was rooted in the resurgent interest in square dancing and folk dancing there in the 1940s, which gave musicians such as Pete Seeger popular exposure. The folk revival more generally as a popular and commercial phenomenon begins with the career of The Weavers, formed in November 1948 by Pete Seeger, Lee Hays, Fred Hellerman, and Ronnie Gilbert of People's Songs, of which Seeger had been president and Hays executive secretary. People's Songs, which disbanded in 1948–49, had been a clearing house for labor movement songs (and in particular, the CIO, which at the time was one of the few if not the only union that was racially integrated), and in 1948 had thrown all its resources to the failed presidential campaign of Progressive Party candidate Henry Wallace, a folk-music aficionado (his running mate was a country-music singer-guitarist). Hays and Seeger had formerly sung together as the politically activist Almanac Singers, a group which they founded in 1941 and whose personnel often included Woody Guthrie, Josh White, Lead Belly, Cisco Houston, and Bess Lomax Hawes. The Weavers had a big hit in 1950 with the single of Lead Belly's "Goodnight, Irene". This was number one on the Billboard charts for thirteen weeks. On its flip side was "Tzena, Tzena, Tzena", an Israeli dance song that concurrently reached number two on the charts. This was followed by a string of Weaver hit singles that sold millions, including ""So Long It's Been Good to Know You" ("Dusty Old Dust") (by Woody Guthrie) and "Kisses Sweeter Than Wine". The Weavers' career ended abruptly when they were dropped from Decca's catalog because Pete Seeger had been listed in the publication Red Channels as a probable subversive. Radio stations refused to play their records and concert venues canceled their engagements. A former employee of People's Songs, Harvey Matusow, himself a former Communist Party member, had informed the FBI that the Weavers were Communists, too, although Matusow later recanted and admitted he had lied. Pete Seeger and Lee Hays were called to testify before the House Un-American Activities Committee in 1955. Despite this, a Christmas Weaver reunion concert in 1955 was a smash success and the Vanguard LP album of that concert, issued in 1957, was one of the top sellers of that year, followed by other successful albums. [I]t is interesting to consider that had it not been for the explicit political sympathies of the Weavers and other folk singers or, another way of looking at it, the hysterical anti-communism of the Cold War, folk music would very likely have entered mainstream American culture in even greater force in the early 1950s, perhaps making the second wave of the revival nearly a decade later [i.e., in the 1960s] redundant. The Kingston Trio, a group originating on the West Coast, were directly inspired by the Weavers in their style and presentation and covered some of the Weavers' material, which was predominantly traditional. The Kingston Trio avoided overtly political or protest songs and cultivated a clean-cut, collegiate persona. They were discovered while playing at a college club called the Cracked Pot by Frank Werber, who became their manager and secured them a deal with Capitol Records. Their first hit was a catchy rendition of an old-time folk murder ballad, "Tom Dooley", which had been sung at Lead Belly's funeral concert. This went gold in 1958 and sold more than three million copies. The success of the album and the single earned the Kingston Trio a Grammy award for Best Country & Western Performance at the awards' inaugural ceremony in 1959. At the time, no folk-music category existed in the Grammy's scheme. The next year, largely as a result of The Kingston Trio album and "Tom Dooley", the National Academy of Recording Arts and Sciences instituted a folk category and the Trio won the first Grammy Award for Best Ethnic or Traditional Folk Recording for its second studio album At Large. At one point, The Kingston Trio had four records at the same time among the Top 10 selling albums for five consecutive weeks in November and December 1959 according to Billboard Magazine's "Top LPs" chart, a record unmatched for more than 50 years and noted at the time by a cover story in Life Magazine. The huge commercial success of the Kingston Trio, whose recordings between 1958 and 1961 earned more than $25 million for Capitol records or about $195 million in 2014 dollars spawned a host of groups that were similar in some respects like the Brothers Four, Peter, Paul and Mary, The Limeliters, The Chad Mitchell Trio, The New Christy Minstrels and more. As noted by critic Bruce Eder in the All Music Guide, the popularity of the commercialized version of folk music represented by these groups emboldened record companies to sign, record, and promote artists with more traditionalist and political sensibilities. The Kingston Trio's popularity would be followed by that of Joan Baez, whose debut album Joan Baez, reached the top ten in late 1960 and remained on the Billboard charts for over two years. Baez's early albums contained mostly traditional material such as the Scottish ballad, "Mary Hamilton", as well as many covers of melancholy ballads that had appeared in Harry Smith's Anthology of American Folk Music, such as "The Wagoner's Lad" and "The Butcher Boy". She did not try to imitate the singing style of her source material, however, but used a rich soprano with vibrato. Her popularity (and that of the folk revival itself) would place Baez on the cover of Time Magazine in November 1962. Baez, unlike the Kingston Trio, was openly political, and, as the civil rights movement gathered steam, aligned herself with Pete Seeger, Guthrie and others. She was one of the singers, along with Seeger, Josh White, Peter, Paul and Mary and Bob Dylan, who appeared at Martin Luther King's 1963 March on Washington and sang "We Shall Overcome", a song that had been introduced by People's Songs. Harry Belafonte was also present on that occasion, along with Odetta, whom Martin Luther King introduced as "the queen of folk music", when she sang "Oh, Freedom" (Odetta Sings Folk Songs was one of 1963's best-selling folk albums). Also on hand were the SNCC Freedom Singers, the personnel of which went on to form Sweet Honey in the Rock. The critical role played by Freedom Songs in the voter registration drives, freedom rides, and lunch counter sit-ins during the Civil Rights Movement of the late 1950s and early '60s in the South, gave folk music tremendous new visibility and prestige. The peace movement was likewise energized by the rise of the Campaign for Nuclear Disarmament in the UK, protesting the British testing of the H-bomb in 1958, as well as by the ever-proliferating arms race and the increasingly unpopular Vietnam War. Young singer-songwriter Bob Dylan, playing acoustic guitar and harmonica, had been signed and recorded for Columbia by producer John Hammond in 1961. Dylan's record enjoyed some popularity among Greenwich Village folk-music enthusiasts, but he was "discovered" by an immensely larger audience when a pop-folk-music group, Peter, Paul & Mary had a hit with a cover of his song "Blowin' in the Wind". Peter, Paul & Mary also brought Pete Seeger and the Weavers' "If I Had a Hammer" to nationwide audiences, as well as covering songs by other artists such as Dylan and John Denver. It was not long before the folk-music category came to include less traditional material and more personal and poetic creations by individual performers, who called themselves "singer-songwriters". As a result of the financial success of high-profile commercial folk artists, record companies began to produce and distribute records by a new generation of folk revival and singer-songwriters—Phil Ochs, Tom Paxton, Eric von Schmidt, Buffy Sainte-Marie, Dave Van Ronk, Judy Collins, Tom Rush, Fred Neil, Gordon Lightfoot, Billy Ed Wheeler, John Denver, Arlo Guthrie, Harry Chapin, John Hartford, and others, among them. Some of this wave had emerged from family singing and playing traditions, and some had not. These singers frequently prided themselves on performing traditional material in imitations of the style of the source singers whom they had discovered, frequently by listening to Harry Smith's celebrated LP compilation of forgotten or obscure commercial 78rpm "race" and "hillbilly" recordings of the 1920s and 30s, the Folkways Anthology of American Folk Music (1951). A number of the artists who had made these old recordings were still very much alive and had been "rediscovered" and brought to the 1963 and 64 Newport Folk Festivals. One of these, Clarence Ashley, for example, introduced folk revivalists to the music of friends of his who still actively played traditional music, such as Doc Watson and The Stanley Brothers. Burl Ives – as a youth, Ives dropped out of college to travel around as an itinerant singer during the early 1930s, earning his way by doing odd jobs and playing his banjo. In 1930 he had a brief, local radio career on WBOW radio in Terre Haute, Indiana, and in the 1940s he had his own radio show, titled The Wayfaring Stranger, titled after one of the popular ballads he sang. The show was very popular, and in 1946 Ives was cast as a singing cowboy in the film Smoky. Ives went on to play parts in other popular films, as well. His first book, The Wayfaring Stranger, was published in 1948. The Weavers were formed in 1947 by Seeger, Ronnie Gilbert, Lee Hays, and Fred Hellerman. After they debuted at the Village Vanguard in New York in 1948, they were then discovered by arranger Gordon Jenkins and signed with Decca Records, releasing a series of successful but heavily orchestrated single songs. The group's political associations in the era of the Red Scare forced them to break up in 1952; they re-formed in 1955 with a series of successful concerts and album recordings on Vanguard Records. A fifth member, Erik Darling, sometimes sat in with the group when Seeger was unavailable and ultimately replaced Seeger in The Weavers when the latter resigned from the quartet in a dispute about its commercialism in general and its specific agreement to record a cigarette commercial. Josh White was an authentic singer of rural blues and folk music, a man who had been born into abject conditions in South Carolina during the Jim Crow years. As a young black singer, he was initially dubbed “the Singing Christian” (he sang some Gospel songs, and was the son of a preacher), but also recorded blues songs under the name Pinewood Tom. Later discovered by John H. Hammond and groomed for both stage performance and a major-label recording career, his repertoire expanded to include urban blues, jazz, and gleanings from a broad folk repertoire, in addition to rural blues and gospel. Josh White gained a very wide following in the 1940s and had a huge influence on later blues artists and groups, as well as the general folk-music scene. His pro-justice and civil-rights stance provoked harsh treatment during the suspicious HUAC era, seriously harming his performing career in the ‘50s, and keeping him off TV until 1963. In folk-music circles, however, he retained respect and was admired both as a musical hero and a link with the Southern rural-blues and gospel traditions. Harry Belafonte, another influential performer, inspired in part by Paul Robeson started his career as a club singer in New York to pay for his acting classes. In 1952, he signed a contract with RCA Victor and released his first record album, Mark Twain and Other Folk Favorites. His breakthrough album Calypso (1956) was the first LP to sell over a million copies. The album spent 31 weeks at number one, 58 weeks in the top ten, and 99 weeks on the US charts. It introduced American audiences to Calypso music and Belafonte was dubbed the "King of Calypso." Belafonte went on to record in many genres, including blues, American folk, gospel, and more. In 1959, he starred in Tonight With Belafonte a nationally televised special, that introduced Odetta in her debut to a prime time audience. She sang "Water Boy" and performed a duet with Belafonte of "There's a Hole in My Bucket" that hit the national charts in 1961. Odetta Holmes – Starting in 1953 singers Odetta and Larry Mohr recorded some songs, with the LP being released in 1954 as Odetta and Larry, an album that was partially recorded live at San Francisco's Tin Angel bar. Odetta enjoyed a long and respected career, with a repertoire of traditional songs (e.g., spirituals) and blues until her death in 2009, becoming known as "the Voice of the Civil Rights Movement", and "the Queen of American Folk Music" (Martin Luther King Jr.). The Kingston Trio was formed in 1957 in the Palo Alto, California area by Bob Shane, Nick Reynolds, and Dave Guard, who were just out of college. They were greatly influenced by the Weavers, the calypso sounds of Belafonte, and other semi-pop folk artists such as the Gateway Singers and The Tarriers. The unexpected and surprising influence of their hit record "Tom Dooley" (which sold almost four million units and is often credited with initiating the pop music aspect of the folk revival) and the unprecedented popularity and album sales of this group from 1957 to 1963 (including fourteen top ten and five number one LPs on the Billboard charts) were significant factors in creating a commercial and mainstream audience for folk-styled music where little had existed prior to their emergence. The Kingston Trio's success was followed by other highly successful 60s pop-folk acts, such as The Limeliters and The Highwaymen. Joan Baez’s career got started in 1958 in Cambridge, Massachusetts, where at 17 she gave her first coffee-house concert. She was invited to perform at the 1959 Newport Folk Festival in 1959 by pop folk star Bob Gibson, after which Baez was sometimes called “the barefoot Madonna", gaining renown for her clear voice and three-octave range. She recorded her first album for an established label the following year – a collection of laments and traditional folk ballads from the British Isles, accompanying the songs with guitar. Her second LP release went gold, as did her next (live) albums. One record featured her rendition of a song by the then-unknown Bob Dylan. In the early 1960s, Baez moved into the forefront of the American folk-music revival. Increasingly, her personal convictions – peace, social justice, anti-poverty – were reflected in the topical songs that made up a growing portion of her repertoire, to the point that Baez became a symbol for these particular concerns. Bob Dylan often performed, and sometimes toured, with Joan Baez, starting when she was a singer of mostly traditional songs. As Baez adopted some of Dylan's songs into her repertoire and even introduced Dylan to her avid audiences, a large following on the folk circuit, it helped the young songwriter to gain initial recognition. By the time Dylan recorded his first LP (1962) he had developed a style reminiscent of Woody Guthrie. He began to write songs that captured the "progressive" mood on the college campuses and in the coffee houses. Though by 1964 there were many new guitar-playing singer/songwriters, it is arguable that Dylan eventually became the most popular of these younger folk-music-revival performers. Judy Collins, affectionately known as ""Judy Blue Eyes"" debuted in the early 1960s. At first she sang traditional folk songs or songs written by others — in particular the protest poets of the time, such as Tom Paxton, Phil Ochs, and Bob Dylan. She also recorded her own versions of important songs from the period, such as Dylan's "Mr. Tambourine Man", Ian Tyson's "Someday Soon", and Pete Seeger's "Turn, Turn, Turn". The Smothers Brothers used comedy to promote folk music on their CBS-TV variety series (1967-1969), along with social protest against the Vietnam War et al. ^ From the Washington Post, Feb 12, 1944: "The Labor Canteen, sponsored by the United Federal Workers of America, CIO, will be opened at 8 pm tomorrow at 1212 18th st. nw. Mrs. Roosevelt is expected to attend at 8:30 pm"
^ Cf. Cantwell, Robert, When We Were Good (1996), pp. 110, 253. ^ "The Biggest #1 Pop Songs in U.S. Chart History". Whitgunn.freeservers.com. May 3, 2011. Retrieved December 6, 2012. ^ Ron Eyerman and Scott Barretta, "From the 30s to the 60s: The Folk Music Revival in the United States", Theory and Society, Vol. 25: 4 (August 1996): 501–543. ^ "Israel Young, who was deeply involved in the New York folk scene from 1945 onward, recounts (through personal correspondence) that he remained largely unaware of the role of the old left on the folk scene in the first decade of his activism", quoted in Ron Eyerman and Scott Barretta, op. cit., 1996, ff. p. 542. ^ Kingston Trio On Record, p. 33. ^ Fink, Matt. "Review of Here We Go Again". AllMusic Guide. Retrieved July 17, 2009. ^ Billboard Chart 11/16/59. Retrieved August 14, 2010. ^ Billboard Chart 11/23/59. Retrieved August 14, 2010. ^ Billboard Chart, 11/30/59. Retrieved August 14, 2010. ^ Billboard Chart, 12/7/59. Retrieved August 14, 2010. ^ Billboard Chart, 12/14/59. Retrieved August 14, 2010. ^ "Tenderfoot Tenor for The Kingston Trio". Show Business Magazine. September 5, 1961. Retrieved July 16, 2009. ^ a b Eder, Bruce. "Biography of The Kingston Trio". AllMusic Guide. Retrieved July 17, 2009. ^ "Harry Smith biography". Harrysmitharchives.com. January 14, 2007. Archived from the original on July 11, 2011. Retrieved June 20, 2011. ^ "Top U.S. Artists by Category". Billboard. 76 (52): 23–4. December 26, 1964. ^ Cohen, Ronald D. (2002). Rainbow Quest: The Folk Music Revival and American Society, 1940-1970. University of Massachusetts Press. p. 189. ISBN 1558493484. ^ "A Spontaneous Performance Recording Page". The Clancy Brothers and Tommy Makem Website. Retrieved June 1, 2014. ^ Zhito, Lee (May 5, 1962). "Disk Firms Vie for NARAS Honors: RCA Victor Leads List of Grammy Nominations". Billboard Music Week. 74 (18): 4. ^ Dylan, Bob; Bono, "The Bono Vox Interview," Hot Press, 8 July 1984. ^ Hamill, Denis (December 22, 2009). "Last Clancy brother Liam is buried, but clan leaves impression on Irish music". Daily News. New York. ^ Folk Hibernia (television). BBC 4. 2006. ^ Hamill, Dennis (November 7, 1999). "'Tis a Fine Way to Honor Paddy Clancy". New York Daily News. pp. City Beat (section). ^ Madigan, Charles M. (November 20, 1998). "Irish Folk Singer Patrick Clancy". Chicago Tribune. Retrieved April 19, 2014. ^ "This Land is Your Land: Rural Music & the Depression". Xroads.virginia.edu. Archived from the original on February 7, 2003. Retrieved December 6, 2012. ^ a b Spivey, Christine A. "This Land is Your land, This Land is My Land: Folk Music, Communism, and the Red Scare as a Part of the American Landscape". Archived from the original on June 25, 2008. Retrieved 2012-07-12. The Student Historical Journal 1996–1997, Loyola University New Orleans, 1996. ^ How Can I Keep from Singing? : The Ballad of Pete Seeger - David King Dunaway - Google Books. Books.google.com. Retrieved December 6, 2012. ^ Cohen, Ronald (1996). Folk Music: The Basics. Routledge. p. 125. ISBN 9781136088988. ^ Rothberg, Abigail. "Legendary Village folk artist remembered". Downtownexpress.com. Retrieved December 6, 2012. Lomax, Alan, Woody Guthrie, and Pete Seeger, eds. Hard Hit Songs for Hard Hit People. New York: Oak Publications, 1967. Reprint, Lincoln University of Nebraska Press, 1999. Scully, Michael F. The Never-Ending Revival: Rounder Records and the Folk Alliance. Urbana: University of Illinois Press, 2008. Folk Music Revival. American Folklife Center. Library of Congress. "Blowin in the Wind: Pop discovers folk music" Part 1. Show 18 of John Gilliland's The Pop Chronicles, Digital Library of the University of North Texas. The story of the origins of the American Folk Revival is narrated by Arlo Guthrie, Pete Seeger, Nick Reynolds of The Kingston Trio, Roger McGuinn of The Byrds, with satirist Stan Freberg (as a bongo-playing 1950s beatnik). It features Lead Belly, The Almanac Singers, Woody Guthrie, Harry Belafonte, and The Kingston Trio. In it, Pete Seeger is heard repeatedly crediting Alan Lomax as the most important figure in initiating the American folk revival by taking folk music out of the archives and "giving it to singers". Nick Reynolds and Roger McGuinn credit The Weavers and the labor songs of the Almanac Singers as the inspiration for The Kingston Trio and The Byrds. The role of Time magazine in asserting distinctions between pop versus "purist" folk music is also discussed. See also the continuation of this show "Blowin in the Wind: Pop discovers folk music" Part 2 Show 19, featuring Odetta, The Limeliters, The Brothers Four, Peter Paul and Mary, Glenn Yarbrough, Buffy Sainte-Marie, Judy Collins, and Joan Baez. The Folk File: A Folkie's Dictionary by Bill Markwick (1945-2017) - musical definitions and short biographies for American and U.K. Folk musicians and groups. Retrieved August 9, 2017.